This blog post will examine the importance of wheelchair scales, including how to use a wheelchair scale, who they are used by and why they are necessary for medical and care environments. What is a wheelchair scale? A wheelchair scale is a weighing scale that includes a large platform with ramps and handles for easy wheelchair accessibility. Wheelchair scales typically feature diamond-plate or patterned steel for grip and are portable for easy moving and storage. Different from wheelchair scales in design, standard chair weighing scales include a chair and armrests as part of the weighing unit. Why do you need a wheelchair scale? A standard bathroom weighing scale often will suffice, but there are certain situations that require different types of scales. Gyms and health spas sometimes invest in weighing devices with BMI calculation. Professional and governmental medical facilities might require weighing equipment that is accessible for all patients and that features class II or III approval. Where are wheelchair scales found? Wheelchair scales offer an alternative to the standard physician scale that requires a user to step on the platform and stand. Wheelchair scales are used for patients with limited or no mobility. They are commonly found in hospitals, doctor’s offices, clinics and assisted care homes. Some varieties of wheelchair scale can be folded and made portable for personal use within the user’s home or by visiting caretakers. Locate a sizable, safe and easily accessible weighing area. If you do not have a permanent weighing area or if space is limited, prepare the area in advance to ensure user safety. Using the wheelchair scale handles, carefully lift and place the scale on the floor weighing area. If calculating BMI, configure the scale prior to weighing to record this. Depending on the scale, you may need to attach additional accessories such as thermal printers to record these results on paper. The Adam PTM includes a USB port to attach an ATP thermal printer, allowing users to record results. After the scale and accessories are set up, carefully move the wheelchair onto the scale’s weighing platform. When the weight display stabilises, record the weight. 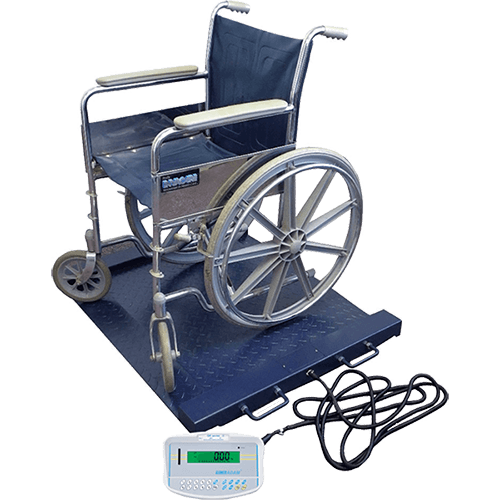 Wheelchair scales are weighing scales outfitted with handles, platform grip and ramps to easily weigh wheelchair patients or users with limited mobility. Wheelchair scales are typically used in health and medical facilities such as doctors’ offices, hospitals and care homes. The MCW chair weighing scale places accessibility at the forefront of design, allowing a user to sit down whilst the weighing scale underneath the chair takes the weight and BMI measurment of the user. These scales can be combined with thermal printers via an RS-232 cable for monitoring weight over a given time period. Suitable for use in care homes, health centres and doctors offices. PTM wheelchair scales are versatile, multi-purpose platform floor scales constructed from non-slip mild steel. PTM scales come with fixed handles to allow the scale to be carried and placed where needed. In-built mild steel ramps make the scale easily accessible, ideal for manoeuvring wheelchair users and patients with limited mobility onto the weighing surface. This digital wheelchair scale can be combined with GK indicators for increased functionality.